Do you relate to those webcomics which say ‘things only introverts will get’ or do you just love being by yourself? Here are some places where you can do just that, but with some coffee, wifi, food, and all that fun stuff! As the name already suggests, you’re going to be in pitch darkness and enjoy a meal and a new experience. What if you run into someone you know? Don’t worry, that’s not going to happen! Relish your food, experience eating in a dark room and being served by people who are blind, and have some amazing you-time. Want to go out to eat but don’t want no conversation? Here, come sit down and wait for a robot to come take your order. You read that right. The robot-themed wall art and warm robot waiters will make sure you have a great time! The menu includes dishes like dragon chicken, biryani, Thai roasted chicken, and, mixed veg hotpots. Imagine having tea in the middle of a garden that looks like it’s straight out of Alice In Wonderland. You can do that here, amidst glowing yellow walls with huge mushrooms and flowers and quirky little teacups on creepers. Pull out a garden stool, get a book from the red bookshelf, and cosy up, Alice - it’s your wonderland! Don’t forget to get the MadHatter’s Tea Pot, a specialty here. How does spending an evening with a p̶e̶r̶s̶o̶n̶ (just kidding) telescope amidst galaxies sound? This science-themed cafe is filled with scientific pictures and facts and also has a bunch of science-fiction books to keep you company. A giant TV will show you all that’s up with different wildlife, so sit back and enjoy. Drown into a barrage of board games - right from pallanguzhi and dhayum to monopoly, UNO, and pictionary, you can game off in a corner. Each table has a theme (like a Ludo table for instance) and a separate room where there’s PlayStation. 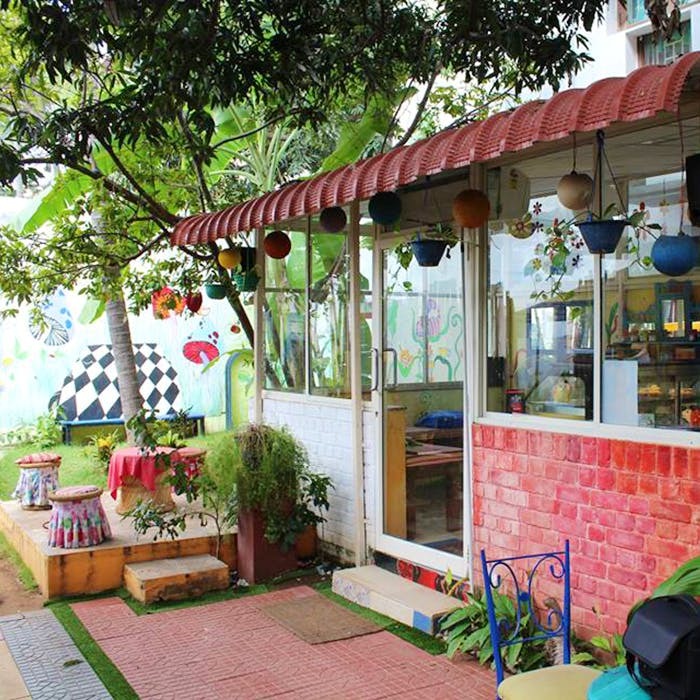 Sip on your kaapi and munch on piping hot bondas while playing a bit of Fifa or Call Of Duty. Does this feel like home yet? Known as an 'anti-cafe', Backyard has a very beach shack kind of vibe to it. It looks just like a little bedroom and you probably won’t be able to tell the difference. Coffee, wifi, and loads of games like Hungry Hippos and Scrabble, you can perfect the art of solitude here. Get yo’ hermit on and have a good time at Monk’s Plate, which is perfect for you if you love some glug-glug while chilling. This pub will let you have your alone time and you can be you right in the midst of chaos. Trippy monks on the walls all around and one with headphones on, you’ll blend right in.